The company said it had purchased opted-in data from a third party supplier who had generated their data from a number of websites, but the consents obtained on those websites did not meet the required standard to satisfy the Privacy Electronic Communications Regulations (PECR) which is necessary for the sending of texts and automated voice calls. Although LAD Media’s data suppliers had claimed that the data they had supplied was suitably opted in for the sending of text messages, a commonly misunderstood fact is that it is the company whose message is carried on the text who is held liable and not the data supplier if the opt-ins are later found to be insufficient. 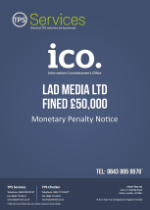 In this case, the ICO did not accept the company’s data supplier’s claims that the data was suitably opted in so LAD Media were held liable for breaching PECR. The ICO stated that the company had failed to conduct sufficient due diligence on its data suppliers before starting the text campaign. A lack of due diligence is becoming a common criticism levied by the ICO of the companies it has fined during 2016 and 2017. What method was used - e.g. was it opt-in or opt-out? Was the information provided clear and intelligible? How was it provided - e.g. behind a link, in a footnote, in a pop-up box, in a clear statement next to the opt-in box? A reputable list broker should be able to demonstrate that the marketing list for sale is reliable by explaining how it was compiled and providing full details of what individuals consented to, when and how. If the seller cannot provide this information, a buyer should not use the list. “The primary reasons for LAD Media getting fined are fundamentally the same reasons for many other fines recently. The ICO’s change of position on the way it interprets PECR has caught and will continue to catch many companies out.